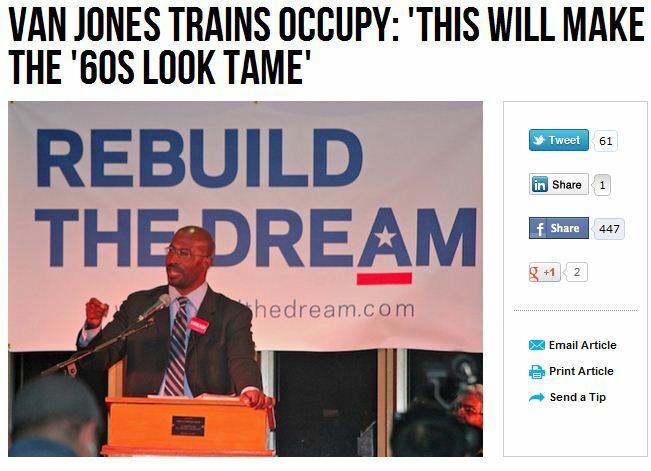 CONSERVATIVE INFILTRATES MEETING WHERE FORMER CHIEF OBAMA ADVISER VAN JONES PROMISES VIOLENCE IN THE STREETS THIS ELECTION CYCLE……. – The Tundra Tabloids……. CONSERVATIVE INFILTRATES MEETING WHERE FORMER CHIEF OBAMA ADVISER VAN JONES PROMISES VIOLENCE IN THE STREETS THIS ELECTION CYCLE……. Folks just keep in mind that this is a man Obama though worthy enough to advise him, before his audacious statements became too much of an embarrassment that he was eventually sent packing. I have been warning/predicting to my readers in the US for a long time now, of the outbreak of violence being planned this Spring/Summer by hard-core Leftists. If you follow the rhetoric of the principal players, the meetings that they supervise or speak at, the high profile visibility of the socialists at street protests and their training seminars being promoted at them, you will realize just what exactly is in store this election cycle. BREITBART: There were about 35 people there. We met in a building on campus. Two women appeared to be in their early twenties, one was African American. One man that co-led the event appeared to be around thirty. Everyone else seemed to be fifty- to sixty-year old white people. I felt like I was at a tea party for Socialists. NOTE: In a recent panel on a TV talk show, Van Jones insisted that he left his ”radical-ness” from his college days. He was clearly lying. Previous Post Previous Post MICHAEL COREN TELLS IT LIKE IT IS, COMMON SENSE OUT THE WINDOW WHEN THE MEDIA REPORTS ON ISLAMO TERROR……..
Next Post Next Post TERRORISTS RELEASED IN SCHALIT EXCHANGE DEAL RETURN TO TERROR…….